Our spring meeting is generally focussed on postgraduate research – so we would like to invite members who would like to make a presentation (oral or poster) to let me know. We are also planning on a few new initiatives this year, the first of many in the lead up to INQUA 2019 (www.inqua2019.org/). To this end we plan on adding a selection of talks celebrating key Quaternary Scientists to the Spring Meeting programme (including Frank Mitchell, Sydney Mary Thompson, Bill Watts, Valerie Hall and Robert Lloyd Praeger). These talks will subsequently form the core of a booklet to be published by IQUA. We would like to invite IQUA members to contribute short papers on OTHER Quaternary Scientists to this booklet. Please send your suggestions to catherine.dalton@mic.ul.ie or eocarro@tcd.ie by April 1st 2018. The 2017 IQUA Spring Meeting and AGM was hosted by the School of Archaeology in UCD on Saturday the 22nd of April at the Ardmore Annexe, Belfield, Dublin. The meeting was open to all and consisted of short (20 mins) presentations on any area of new or ongoing Quaternary research. Postgraduate and post-doc students were especially welcome and were encouraged to take advantage of the opportunity to present in an informal and friendly setting. Both oral and poster presentations were invited and there was a prize for best postgraduate talk which went to Sabrina Renken for her talk entitled ‘Foraminifera: More than ONE proxy: An example from the north-eastern Atlantic’. The meeting was followed by the IQUA AGM on the Saturday afternoon. It ws decided that the Autumn Field Meeting this year would be held in Donegal and will be organised by Malcolm McClure and Ellen O’Carrol. The IQUA 2016 Spring Meeting was held on Saturday 9th April at the School of Geography and Environmental Science, Ulster of University (Coleraine campus). The meeting consisted of presentations on new and ongoing Quaternary research, and included a poster session. See the full meeting schedule and speaker line-up. The meeting was followed by the IQUA AGM on the Saturday afternoon and a field trip along the North Coast on Sunday morning (April 10th). The field trip was led by our colleagues Peter Wilson and Colin Breen and visited several sites along the North Coast from Portrush to Ballycastle to look at records of sea level changes, Dunseverick castle and some glaciolacustrine/marine landscapes. 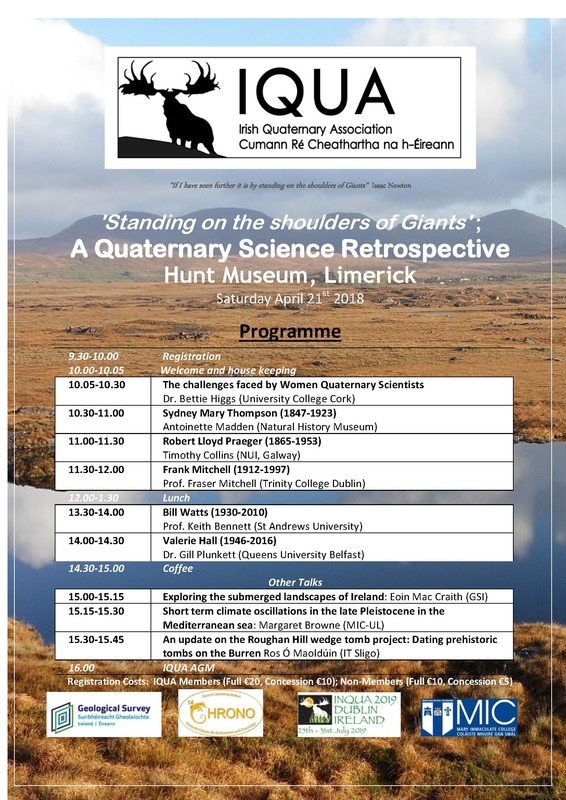 IQUA is pleased to report upon a succesful Spring Meeting and AGM on Saturday the 27th of April, 2013, in the Moore Institute Seminar Room of the National University of Ireland Galway. 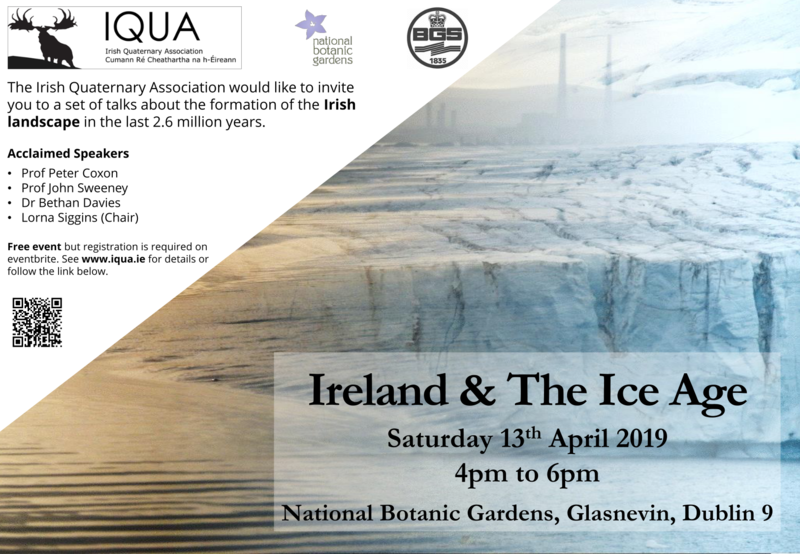 The meeting was hosted by the Palaeoenvironmental Research Unit in the School of Geography and Archaeology, and comprised a series of short talks focusing on new and ongoing Quaternary research taking place in Ireland and abroad. R egistration commenced at 9.30am and attendance was free. Prof. Michael O’Connell (Palaeoenvironmental Research Unit, School of Geography and Archaeology, NUIG) delivered the keynote address. IQUA’s AGM followed at 3pm. IQUA passes its sincere thanks to the conference organizers, Aaron Potito and Karen Molloy, for their excellent work. IQUA’s Spring Meetings, in particular, are designed to be a venue for postgraduate and postdoctoral members to gain valuable experience and feedback in a friendly, informal setting. 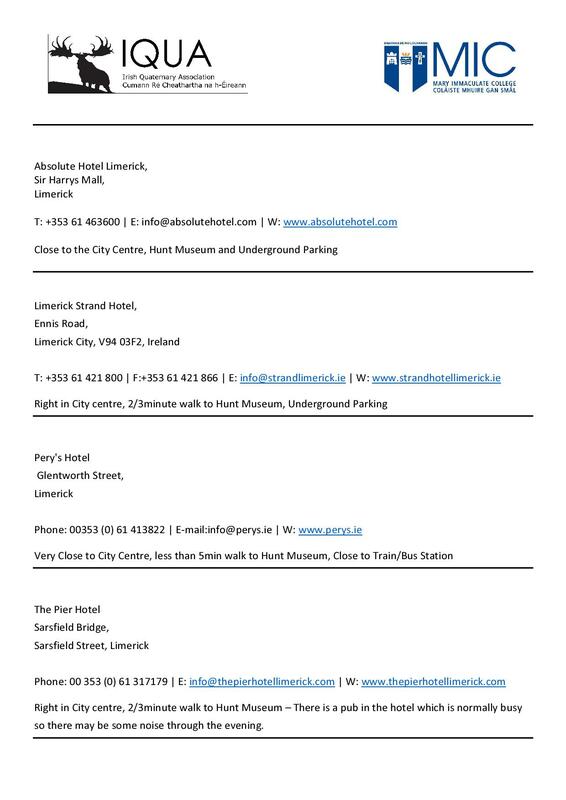 The IQUA Spring Meeting 2013 – Programme & Map can now be downloaded, as can the IQUA 2013 Spring Meeting Poster. Our thanks to all the conference participants and attendees. The meeting also featured an optional fieldtrip, led by Michael Gibbons, on Sunday 28th April. This focused on a range of sites, including a group of cairns on Ballyvaughan Bay, a seaweed farm visible in the inter-tidal zone on Aughinish Island (the best preserved example in the country) and a complex of midden sites on Kinvara Bay. The middens stretch over hundreds of metres and are found on both sides of Kinvara Bay (for images see pdf, 1.44mb). Some contain bone. The trip departed Galway c.10.30 and finished c.15.00 hrs.